I love taking small embroidery designs and combining them into interesting shapes, especially in squares (quilt blocks) oval and circular ones. Most of my collections feature some type of edging or border, but as I add a border I am aware that I create a problem. 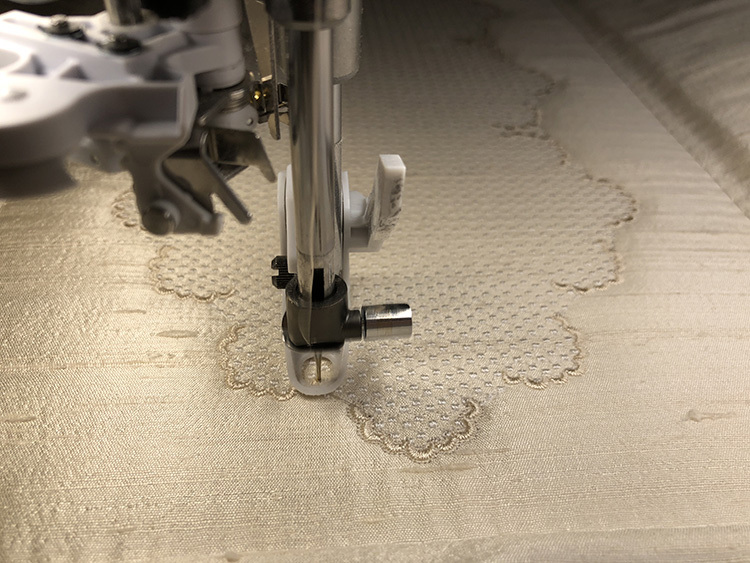 Tiny circles, leaves and buds on the edge of the border mean that the design cannot be given the normal scalloped edge treatment where the underlay is embroidered and the fabric carefully trimmed away before satin stitches are added to finish off the design. This is GFE-ARB-4-8 and I will be including another version of this in the final set, Arabella Bullion 5 for 12″ x 8″ hoops. I had such fun creating this, squeezing it into a 360mm x 150mm hoop. 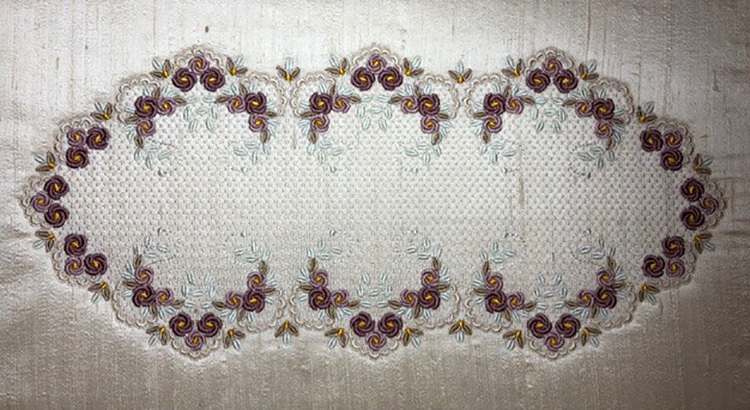 I hope you like the background which is made up of the embroidery stitches that decorate the smocked panels in the collection. It is a big design with 144072 stitches so I thought I should share how I stitched it out. I cleaned out my bobbin area and popped a new gold needle in my machine before starting. Although the design has been created for a 360mm x 150mm hoop, I choose my 360mm x 200mm hoop, because it is a newer hoop to stitch it out and hooped one layer of stitch and tear. On this I attached a layer of medium thickness batting (Vilene) that I needed to test out. I prepared a piece of dark cream silk dupion 550mm x 450mm by steaming it before I began and attached that to my hooped staibiliser with temporary adhesive spray. 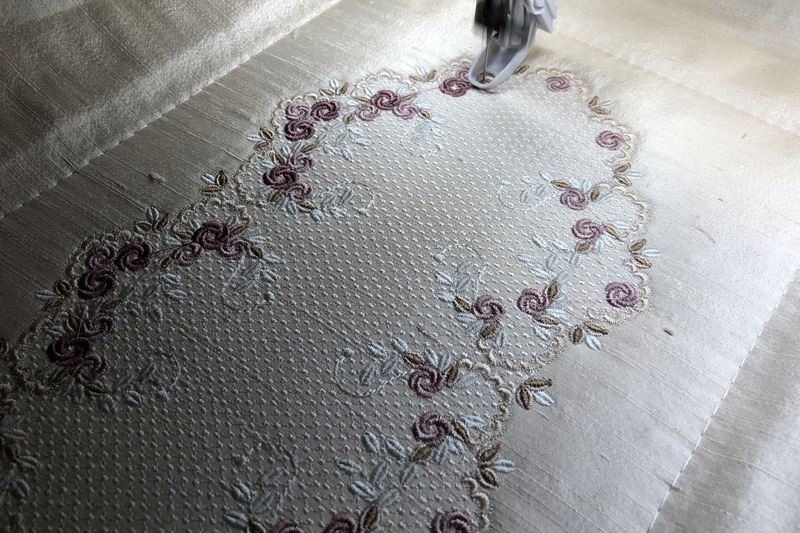 Although the design calls for Sulky Rayon 1127 Medium ecru, as the first thread I used 1071 Off white as a contrast. As you can see the white appears quite a cream colour. A little ways into the stitch out I noticed that I was getting a lot of breaks. We can all encounter this frustration, and it is especially annoying on a large design. 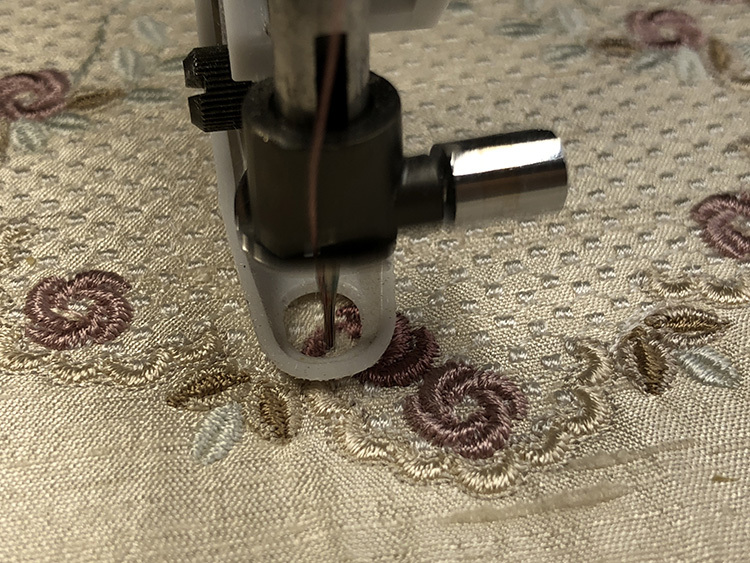 In the end I turned off my machine, took off the embroidery unit and placed it back re-calibrating it, changed the needle to a top stitch one as the batting made the project thicker, cleaned out the bobbin area again and I also changed the thread. Hey presto this solved the problem, but my reservation was that I did several things so I was not quite aware which was the culprit!! I suspect it was some “old” thread and maybe the needle and I suppose testing the “old” thread would confirm whether it needs to be thrown out. I also changed some of the colours in this design to match the colours in the room where I wanted to place the finished project. These are the changes that I made. #6 colour was changed to Sulky Rayon 1128 – Dark Ecru, #7 colour (small bullions) was changed to Sulky Rayon 1808 – Velvet Slipper, #8 colour (large bullions) was changed to Sulky Rayon 1304 – Dewberry and I did the centres in Sulky Rayon 1137 – yellow orange. I thought they were just a little too bright but at least with the centres of flowers you can attach a pearl or crystal to hide them away if necessary! 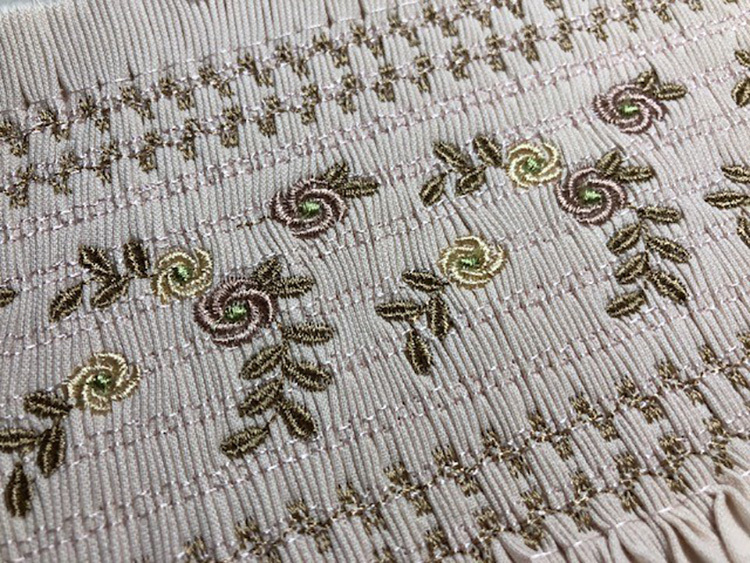 Next time I will show you how I finish off this embroidery, but I am delighted with how the embroidery design has sunk into the batting. Although the design took about 3 to 4 hours to stitch out it could be simplified by eliminating the centre but personally I think the finished result is wonderful and worth the time and effort, and those yellow centres are growing on me. 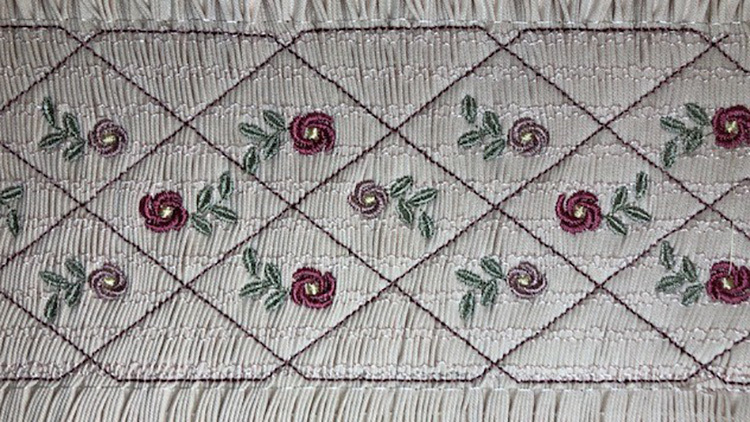 Arabella Bullion 4 has 8 smocking panels as well as this design and 7 other beautiful mega designs. Here are some close ups of two of the panels in which I experimented with other colour ways. Aren’t they gorgeous? 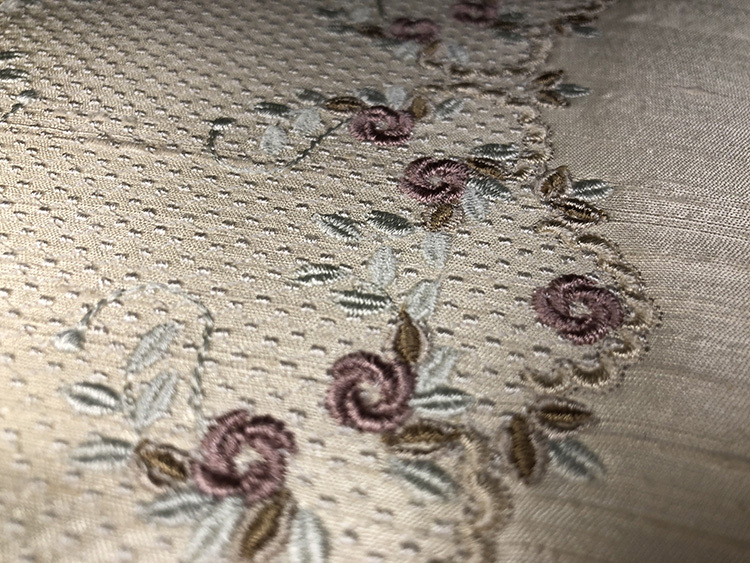 I have so many ideas on how to use these designs and I am sure you will love creating heirloom embroidery projects with them. Arabella Bullion 4 has been released today, January 25th, 2018. Until next time. Enjoy! 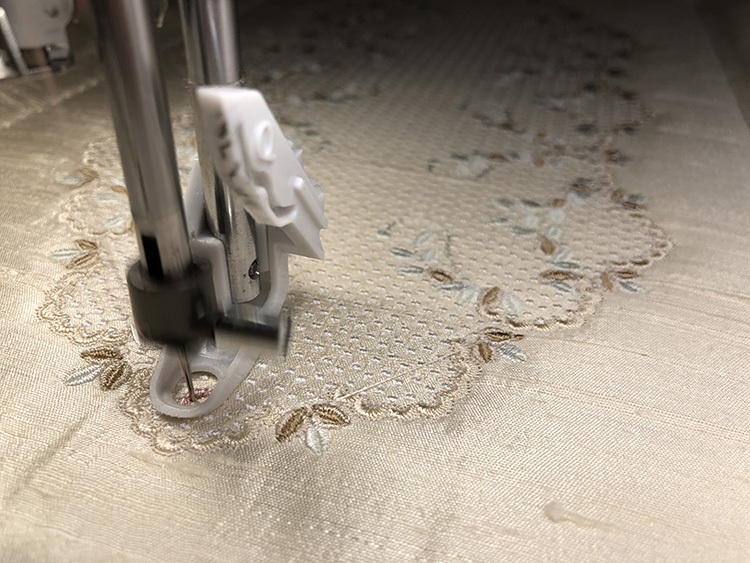 This entry was posted in Discussing machine embroidery, Embroidery projects, New Designs and tagged batting and wadding, embroidery on silk, machine embroidery, making scalloped edges, Solving stitch out problems. Bookmark the permalink. Beautiful design and results! I especially appreciate the tutorial, and the advice about changing the needle to a top stitch one–I would not have known to do that. I have been using Schmetz top stitch needles for a few years now as my dealer recommends them for my machine. However I have a supply of Schmetz Gold embroidery needles to use up. 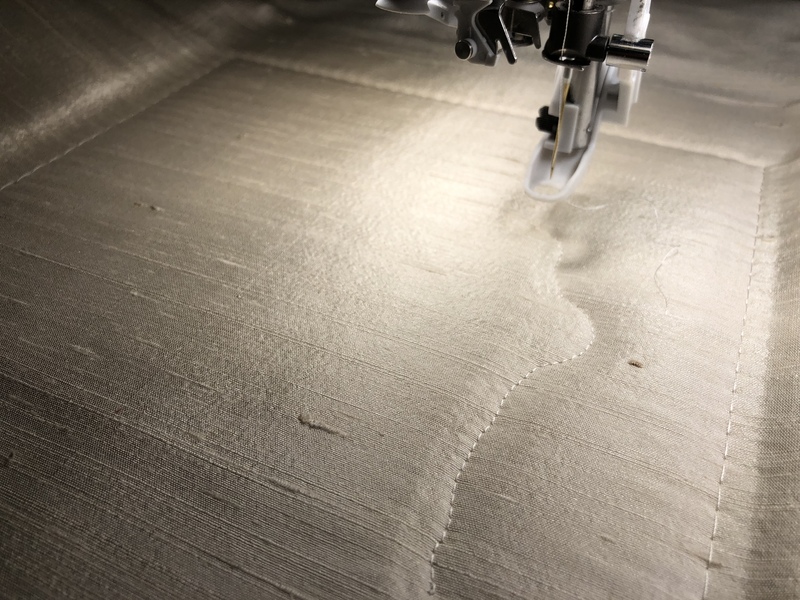 Wow…you take the BEST pictures of your work! love this design…just beautiful and yes, I like the yellow centers, too! Your tutorials and tips are always so helpful and i love your smocked panels with your gorgeous designs.. 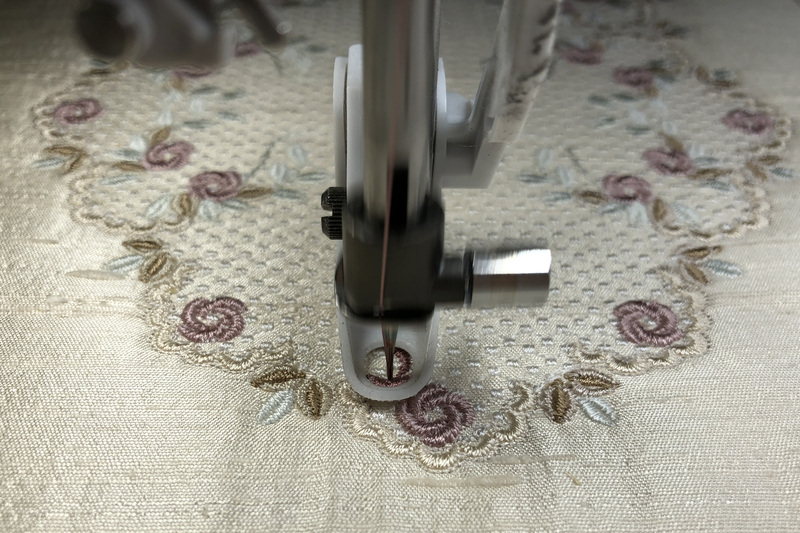 I like to use a topstitch needle too especially, when I sew with metallic threads or a 90-14 needle as the hole is bigger and the metallic thread seems to flow through better. Such perfect stitches. Enjoy watching your tutorials. You have come a long way since you first started. I particulally enjoy you practical knowledge of trouble shooting. Keep up the good work. I only wish I could buy more. Love your work — very inspiring! The tutorial and great pictures area big help, and troubleshooting the needle and threads helps me think outside the box. Thanks for your hard work. This piece is just stunning! Thank you. Your comment has been chosen as “comment of the week” and $30 worth of rewards have been added to your account. I love the center color of the flowers.. It really makes them pop.